Family-owned hotel Harvey's Point is being sold to a investment fund as its owners step back from the business to spend more time with their family. Hoteliers Deirdre McGlone and Marc Gysling put the popular spot up for sale 30 years after the family opened the hotel outside Donegal town. The 4-star luxury accommodation is located on the shores of Lough Eske, at the foot of the Blue Stack Mountains, and has become one of the biggest employers in the region. 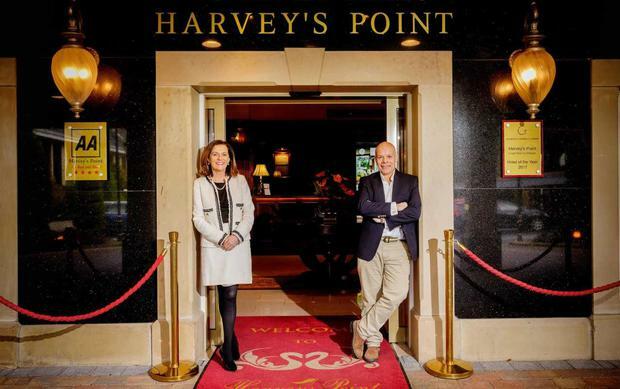 Harvey’s Point has been named TripAdvisor ‘No 1 Hotel in Ireland’ for six of the past seven years. The face of Harvey's Point since it opened, Ms McGlone admitted that the decision to sell was a "life-changing lifestyle choice" for herself and her husband. "Marc and I want to spend more time with each other and with our three teenage children. Life is for living. We have spent an immensely enjoyable 30 years at Harvey’s Point and it has been an amazing journey," she said. "2019 is a milestone year for the hotel and a year of celebrations is planned. However, the time has come for someone else to write the next chapter of the Harvey’s Point story." A fund managed by Davy Real Estate is buying the iconic hotel, and is planning to continue to invest in its development. Mr Gysling said that the new owner is highly experienced in the international luxury hotel market, has plans for its expansion, and will work alongside the current team of around 150 people there. Tom Barrett of Savills has managed the sale of the hotel on behalf of Mr Gysling and Ms McGlone.